“Star Wars: The Mystery of the Rebellious Robot,” one of my favorite small pieces of the ever-expanding Star Wars universe, quietly turned 30 this year. I still have the paperback copy I got when I was eight or nine, my name written inside the front cover in my newly-learned cursive handwriting. I remember thinking that it was so utterly cool that Star Wars could look like this: These illustrations weren’t bland renditions copied from movie stills or the dramatic-but-familiar comic style like the Marvel adaptations, and there was just nothing else like them. Back in 2004, I tracked down their creator, Mark Corcoran, for a feature I was writing on the book 25 years after its publication, which the guys at TheForce.net ran. Mark’s a fun guy to talk pop culture with, and when I contacted him just to catch up and let him know I was planning to re-publish the feature for the book’s 30th anniversary, we wound up chatting for a long time about everything from The Beatles movies (he finds “Help!” underappreciated) to childhood comic collections (he was recently rereading some his original Jimmy Olsen issues) to the James Bond books and movies. I love that. And it led us down another conversational path, talking about how some pieces of your childhood take on importance beyond their original appeal, and years later, they’re more than just action figures or comics because of the emotions and recollections they stir. In 1978, few things were bigger than Star Wars. Yet with George Lucas’ big-screen return to his universe still to come, the Star Wars realm he had created remained comparatively small. Fans were familiar with the sweltering Mos Eisley air and the jungle cries rising above the surface of the fourth moon of Yavin, but with only fleeting teases to the worlds of Alderaan and Dantooine, there seemed so much more worth seeing. Marvel’s comics were already taking the first steps into the unexplored regions of the post-Episode IV galaxy, and Alan Dean Foster’s novel Splinter of the Mind’s Eye presented a new tale of Luke and Leia stranded on an Imperial-controlled swamp planet. It was into this world that 23-year-old New York City-born artist Mark Corcoran stepped, making his mark with one of the first forays into expanding the Star Wars universe with a story expressly aimed at younger fans. “Star Wars: The Mystery of the Rebellious Robot,” published by Random House in 1979, is a tale of droids run amok, mischievous jawas, and a scientific quest to build a super vaporator on Tatooine. 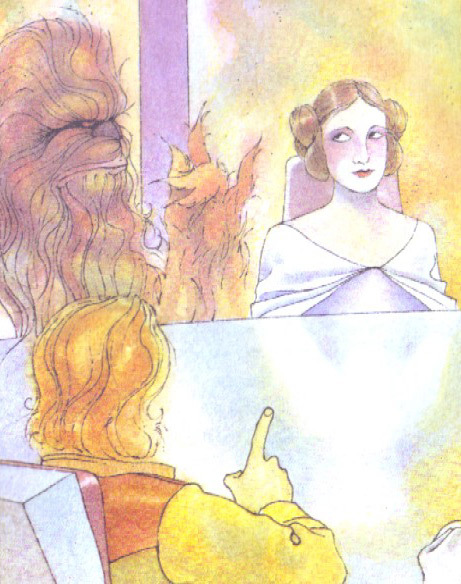 But where Wright’s illustrations take a fairly straightforward approach to the Star Wars characters and settings, Corcoran’s offered one of the earliest stylized interpretations of Lucas’ world outside of the comics: Chewbacca’s mane takes on a multicolored, zero-gravity wildness; there’s a wonderfully exaggerated Han Solo sneer coupled with a puzzlement perfectly captured in his eyes; and even in the blackness of space, a terrifically detailed Millennium Falcon is vibrantly accented with color and shadow. 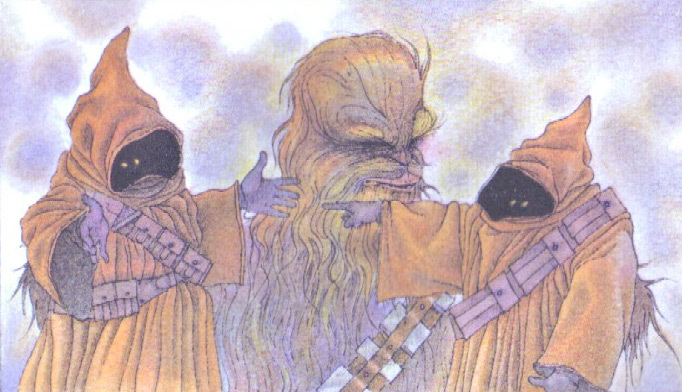 From the frayed edges of jawa robes to a collapse of dust and debris onto Han, Chewie and C-3PO, there is a life and movement to Corcoran’s illustrations that fits well with Lucas’ vision of a lived-in universe. Decades later, Star Wars fans have grown used to seeing their favorite universe through different eyes, most notably in Topps’ Star Wars Galaxy series of trading cards, and recently on the two iterations of the Cartoon Network’s Clone Wars animated series. But even now, Corcoran feels like his work was a bit on the Outer Rim. That anxiety wasn’t helped by the pressure of a quick turnaround time. The Star Wars tsunami, after all, was still in full force, and the demand for tie-ins was high. To deal, in part, with that stress, Corcoran gave a nod toward the subtle details and sly humor he’d enjoyed so much in Star Wars, which he saw for the first time with a group of art school friends and fellow science-fiction fans. Consequently, his favorite bits in “Rebellious Robot” are the ones which sneak up quietly. pointing a finger of blame at the other, who is simply shrugging in acknowledgment. It is a very human moment captured ideally within the frame of Lucas’ alien environment. The illustrator is also proud of a picture which features several of the main characters in an animated group discussion. At least one of the illustrator’s attempts went awry: a double-page spread featuring a cockpit shot of Han and Chewie on the left and the Falcon on the right may seem in order, but Corcoran says the spread was printed upside down, negating his original intention of trying to capture a sense of the freighter’s uncontrolled flips through space. Corcoran was provided with reference photos to help maintain a level of accuracy to detail, especially on the more technical aspects of the droids and spaceships. Probably the most familiar-feeling illustration, though – Threepio emerging from an oil bath in a room which bears a striking resemblance to the Lars’ family garage – was drawn largely from Corcoran’s memory of an identical scene in Star Wars. Another personal favorite is an inset showing the Falcon as a reflection in a close-up shot of Luke’s visor. Now 54, Corcoran says he was simply born to draw, and it didn’t take long for his passion and creativity to set him on an artist’s path while growing up in New York. In art school, Corcoran encountered like-minded artists who’d feasted on Superman comics and monster movies as kids and had gotten hooked on science fiction when they got a little older. And then, leading up to the spring of 1977, Corcoran and his pals saw some eye-popping paintings by a guy named Ralph McQuarrie, and someone in the group had gotten hold of an advance program for Star Wars. Corcoran’s appearance on Lucas’ grand stage turned out to be a brief one. 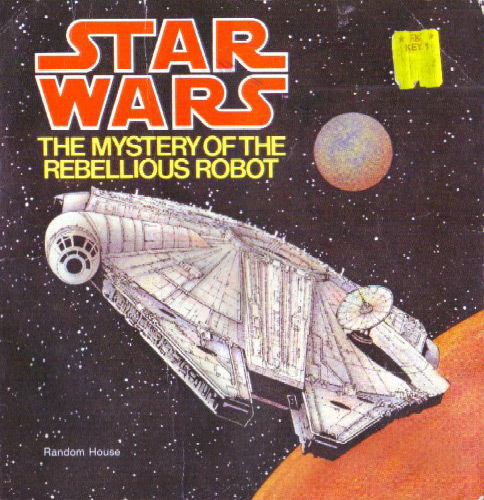 He worked on the book in 1978 and has only one recollection of a Star Wars connection after “The Mystery of the Rebellious Robot” was published the following year. Corcoran has continued to work as an artist in the years since, creating illustrations for children’s textbooks and magazines like “Highlights.” He’s also working on writing and illustrating his own children’s book. And while he’s never returned, at least artistically, to that galaxy far, far away, Corcoran remains amazed at the lasting impact Star Wars, once anticipated as a sci-fi fringe work, has had on popular culture.